When the Samsung washing machine displays a U6 error, it means the drum is out of balance during a cycle. It would be more accurate to say that there is no U6 error code among the Samsung codes (at the moment of writing this article !!!). This is a common Ub error code. For some reason, many users confuse the b letter with 6. Some sites describe the error as “the water level sensor error”. Still, neither manuals, no the official website of the manufacturer provides a description of this error code. Why does the U6 error occur? As a rule, a modern Samsung washing machine will try to balance the load. If this does not work, it will forcibly stop the washing cycle and will turn off. Or it will display the U6 error code. Also, it may pause rotating and display the U6 error. Anyway, the clothes will remain wet. The washer may rotate slowly if the load is quite balanced for low speed. Then if the imbalance is still there, the washer won’t speed up. So the laundry will be much wetter than it gets out after the usual spin cycle. The error code usually appears at the 9th, 7th or 3rd minute before the end of the washing cycle. Before the code is displayed, the drum rotates slowly for a few minutes in one and the other direction. It means the machine tries to balance the laundry load. The timer is paused. The first thing to do about this error is to check if the washing machine is stable. Perhaps during the previous washing and spin cycles, the washing machine moved slightly. So now one of the legs is in the air. One or two items. The washing machine can not rearrange the laundry evenly along the drum surface. The main load lies on only one section of the drum. Load at least 3-4 items. One big (heavy) item and a few small (lightweight) laundry items. Set the spin speed to 400 rpm or start the washing cycle without spin. The loaded items are made of different fabrics. Each type of fabric absorbs water differently. So the weight of the laundry items may differ, and the spin cycle won’t go properly. Load the items made of similar fabrics. Bed linen. During the washing cycle, the items get tangled or get in a duvet cover or a pillowcase. Load no more than 2 kg of the linen at a time. Set the spin speed to 800 rpm. Overload. If there is a lot of laundry in the washer, it is more difficult to spread it in the drum. Only the “Cotton” mode allows the maximum load of the washing machine. 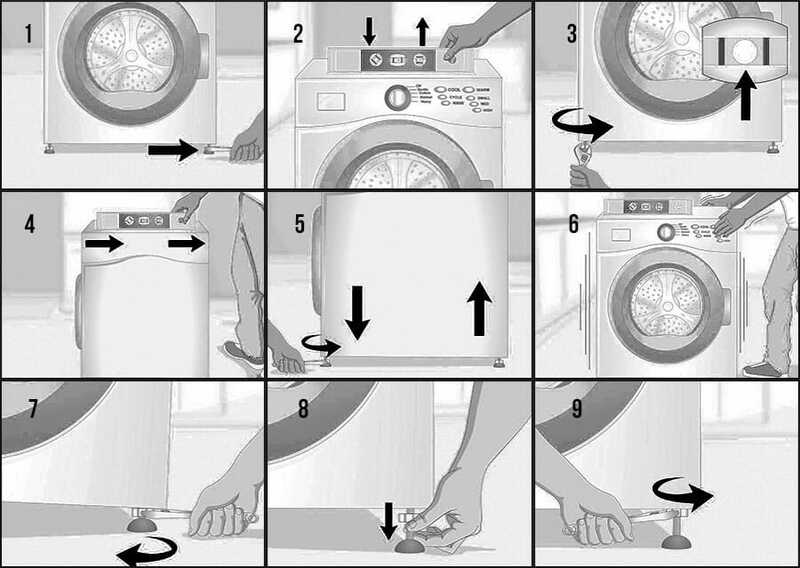 See user manual to learn the right way to load the washer. Nowadays you can buy a Samsung washing machine with a big drum. The average drum is currently for a 6 kg load. But you can buy a washing machine where you can load 7, 8 or even 10 kg of laundry. Perhaps these washers are more likely to stop the spin if underloaded. Why? They require even more items to make the load. Sometimes unbalanced loads occur by chance: the washer spreads the weight in a weird chaotic way. Yet, it is possible to reduce both the risk of imbalance and the amplitude of vibrations. Constant unbalanced loads may cause malfunctions of your washing machine.